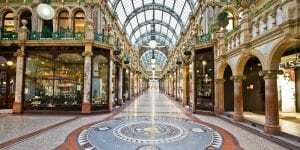 Victoria Leeds is the city’s premium shopping destination bringing together Victoria Quarter and Victoria Gate. Housed in Grade II Listed arcades, Victoria Quarter is home to designer fashion houses such as Louis Vuitton, Vivienne Westwood and Harvey Nichol’s. Victoria Gate is the city’s newest retail addition housing a collection of luxury fashion and lifestyle brands alongside two rooftop bars, a super-casino and a five-storey John Lewis.